Congratulations, Judith! I’ll get in touch with you in a few minutes to arrange the prize giving. Thank you to everyone who participated and made my Grand Opening such a fun and festive event. I had a blast watching the comments roll in over the last few days! Next up, is a review of Nora Roberts’ The Bride Quartet, a tetralogy of romance novels that I read just in time for Valentine’s Day and as a way to participate in Love Month, a February meme going on at the Fluttering Butterflies blog. Summary: Four girlhood friends run a wedding business together. Mac takes stunning photographs; Emma creates beautiful bouquets; Laurel bakes luscious cakes that are also works of art; and Parker, like Dolly Levi (from Hello, Dolly! ), arranges things. Each, in turn, finds the love of her life and after some convincing of both parties, lives happily ever after. I love romances. Thoughts: Parker Brown, the heroine of the fourth novel, runs the wedding business, Vows, that is the umbrella organization for showcasing the talents of her three friends. The business arises from the tragedy of losing both of her parents in a car accident, leaving her the beautiful Connecticut estate, the space where Vows creates a new fantasy for each bride and groom. My personal fantasy at the end of reading these books wasn’t about romance so much as it was about being taken care of by these four strong and creative women while planning the event of a lifetime. Parker, in particular, takes care of everything, reassuring the bride and anyone else with problems that the details will be handled and the overall effect will be as good as imagined or better. What fun it would be to read these four novels back to back during the wedding month of June! Maybe by then they will be out in cheaper mass market paperback editions. But, aren’t these trade paperbacks pretty? I like the soft-edged paper, the silver braiding on the cover fold, and the gentle curved cut-outs on the inside flaps (which are all different–I just checked!). Appeal: For readers who believe they wouldn’t like a Nora Roberts novel, I wouldn’t recommend starting with this quartet (try the Three Sisters Island trilogy or the Sign of Seven trilogy for more substance and invention). But if you have ever enjoyed a Nora Roberts novel and if you have ever had a wedding fantasy, these books will be as sweet as the first strawberries of summer. Challenges: I’ll count these as one book for my Buy One Book and Read It challenge, since I’m pretty sure that I bought the first three in 2010. I used gift cards and coupons to justify to myself buying them in trade paperback instead of waiting to see if they would come out in mass market versions. Reviews: The review from The Globe and Mail where the entire male half of a bridal party reads Happy Ever After as a book club is unique: To be better men, a male-only book club turns to Nora Roberts. Have you read The Bride Quartet? What did you think? 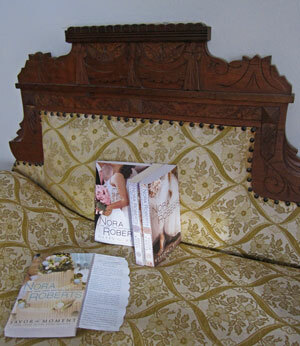 I’m a long-time Nora Roberts fan and I’ve enjoyed the first three books in this tetralogy. (Thanks for the new word.) The fourth, Happy Ever After, is waiting for me now. I agree with your assessment of Robert’s book for anyone interested in “discovering” Robert’s. I usually recommend the older ones too. I didn’t like it when she veered off into the paranormal stuff so I left her for a few years. The Bride Quartet brought me back.